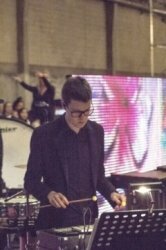 I have been teaching drum and percussion semi-professionally since 2010. Outside of teaching, I perform semi-professionally in variety of genres including Pop, Rock, RnB, Jazz, Fusion, and Gospel, in large venues across Surrey and London. I have extensive experience of working alongside top industry professionals, and have undertaken studio, session and live television work. I am professional and friendly, helping you reach your musical goals, and to inspire you to reach for new goals that you may never have thought possible.